This white wine has citrus aromas coupled with an earthy and mineral after-taste. Despite it being light body, it has a surprisingly silky texture with a structure of a dry Sauvignon Blanc. Santorini is made with organic production methods using the highest-quality Greek fruit. 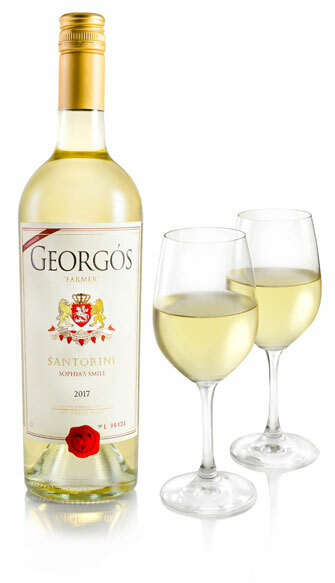 All Georgos wines are handcrafted in small batches with premium, imported and sustainable fruit with no added sugar and low sulfites. This wine is named for the ancient Greek island (circa 2,900 BC). Grapes were grown on the island of Santorini as far back as the Bronze Age. A volcanic eruption destroyed all life on the island (circa 1620 AC). Viticultural and winemaking returned to Santorini to become world renowned during the ascendancy of the Republic of Venice. Santorini is made cleanly from triple hand-sorted fruit and by using organic production methods. Simply delicious! Hand-picked and triple sorted grapes. Mostly, this type of grape is tank fermented, never seeing oak barrels. This is because the grapes are so darn flavorful. The wine doesn’t need extra enhancement from the barrels. We ferment about 90% of it in a stainless-steel tanks. We ferment the remaining 5% in ¬five-year old French oak barrels. At this age, the barrels no longer have much oak flavor but the interaction of the wood, the tiny bit of air absorbed, and the presences of the ¬fine lees, makes this blending component unique. Added back to the tank lot, this small barrel fermented component rounds out the flavors and accentuates the citrus aromas mixed with an earthy, mineral after-taste due to the volcanic soil. This is a bone-dry wine. Like all Georgos Super-Premium Greek wines, this wine is Handcrafted with low sulfites and no additives. If you want to know what a Greek Sauvignon Blanc varietal should taste like, this is it. This delicious wine has the structure of a dry Sauvignon Blanc, rich mineral character, and acidity to stand up to meat, as well as pair magically with sushi, shell fish and seafood.